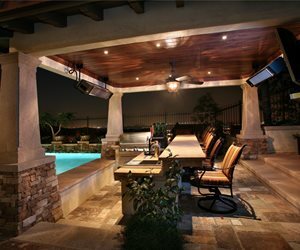 A covered outdoor kitchen will be more comfortable during warm, wet or cold weather. 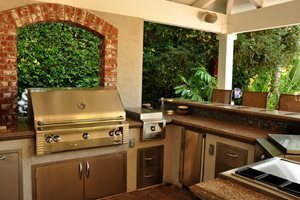 Most landscaping professionals recommend building some type of shelter over an outdoor kitchen. 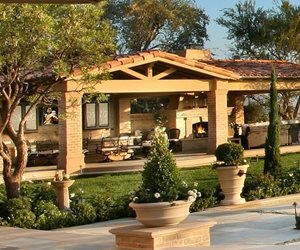 Depending on your needs, your outdoor kitchen can be covered with an open pergola or a fully roofed structure. Landscape architect Drew Sivgals of AMS Landscape Design Studio prefers roofed structures for two reasons: climate control and bringing indoor comforts outside. "On the most basic level, a roofed structure provides protection from sun and rain," says Sivgals. In places like Southern California the sun is the primary concern, while in the southern states seasonal rains can be an issue. 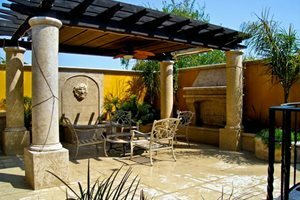 Covering your outdoor kitchen with a solid structure will allow you to use the space in less than ideal weather. Read about how a Louisiana outdoor kitchen was designed to eliminate climate concerns. Built-in grills come in a variety of sizes, ranging from 27 inches across to 54 inches across. When selecting a grill, look into square inches of cooking surface—be sure to find out if this measurement includes the warming rack. Between 400 and 600 square inches should suffice for your family cooking needs, but you can get a grill with up to 1100 square inches if you plan to entertain groups frequently. Sivgals also points out that a roofed structure will help keep heat in. "Many of my clients want to use their cook centers in the fall and winter months," he says, "for maximum efficiency we install heaters along the roofline of the structure." An open structure would not be as effective for this purpose because it would allow the heat to escape, making it difficult to keep the area warm. However, keep in mind that smoke from a grill can also become trapped under a roof, talk to your designer about ventilation options. 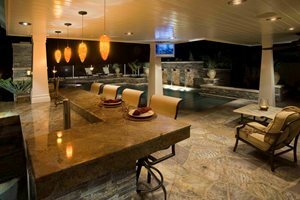 Covering an outdoor kitchen with a roof allows indoor comforts and luxuries to be brought out doors. 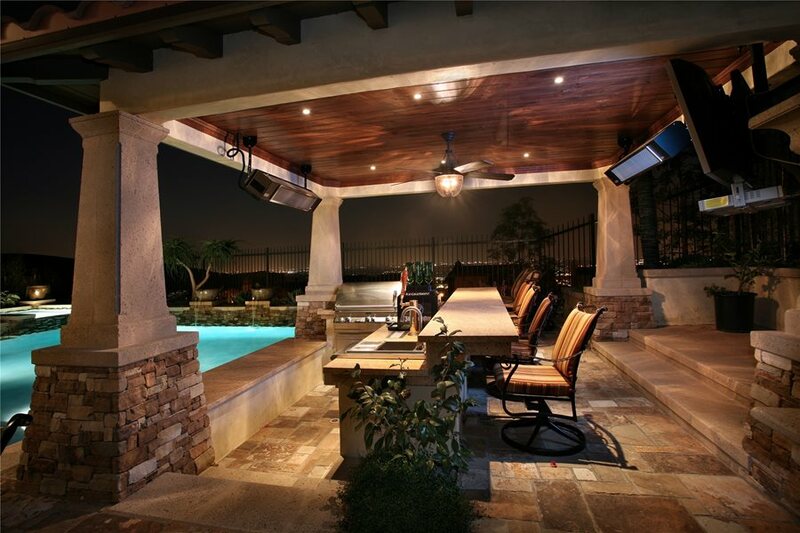 Placing a solid roof over an outdoor kitchen solidifies the feeling of an outdoor room. It also allows for more flexibility in material choices and architectural details. 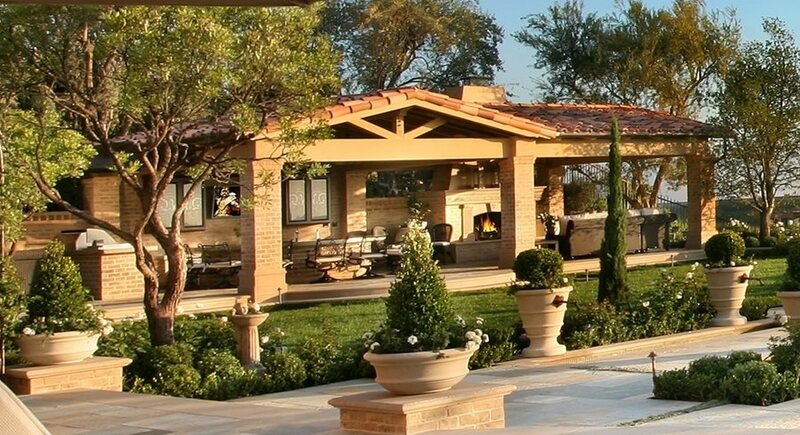 "I strive to make my outdoor designs look and feel like an extension of the house," explains Sivgals. The architectural details he uses play off the architecture of the home, making it look as though the landscape and house were designed and built at the same time. Such details include roof tiles, support columns and countertops. Sivgals says, "Whenever possible I use the same materials that are found inside the home - for example matching outdoor countertops to indoor granite." For Sivgals, every detail matters, down to the ceiling detail, which he often makes of beautiful wood or bamboo thatching for a less expensive option.